The home side remained unchanged from the team that had drawn against Beith in the previous week, with the Glens looking for the 3 points that would take them to 24 points which is normally enough for Superleague Premier Division survival. 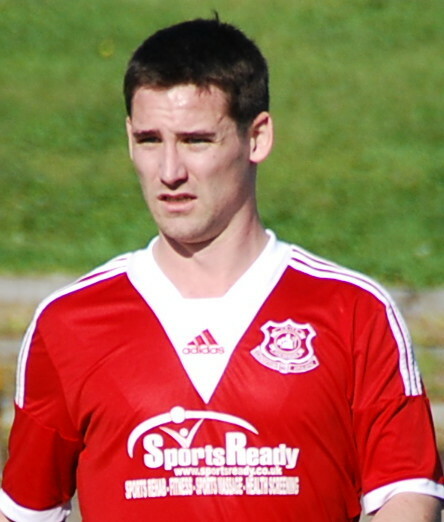 The home side started strongly and opened the scoring on the 25th minute from the penalty spot through striker Alain Kinney.Following a good run from the lively Darren McGill, the ball fell to Kinney and he appeared to be held back by the Petershill defender which resulted in a penalty being awarded. Kinney stepped up to send Petershill goalkeeper Steven McNeil the wrong way . The Glens continued to dominate possession without really creating many clear cut chances. The turning point in the match happened in the 42nd minute, following the award of a penalty to Petershill and the dismissal of goalkeeper Brian McGarrity. A short pass back to McGarrity from central defender Jamie McGeoghegan was intercepted by the Petershill striker and as he tried to round McGarrity the keeper brought him down, giving the referee little choice but to award a penalty. Although the referee initially showed a yellow card to McGarrity following a discussion with his assistant this was subsequently upgraded to a red card. This forced the Glens into a reshuffle with full back Craig Menzies being replaced by backup goalkeeper Buchanan, with Daniel Orsi switching from central midfield to right back. After a lengthy delay,midfielder Kieran Daw’s powerful penalty gave Buchanan no chance. Although down to ten men for the full second half, Glens still enjoyed the majority of the possession and were unlucky to take the lead through midfielder Jamie McKernon. A great driving run by McKernon saw him drift past three Petershill players before firing a shot against the inside of the post with the ball falling to Kinney however his weak effort was blocked and cleared. Petershill against the run of the play went into the lead on the 79th minute. A deep cross from the left hand side picked out the unmarked Michael Daly and although Buchanan managed to get a hand to it, his close range header proved to be too powerful. Glens went close to equalising shortly afterwards through substitute Craig McGuffie. A deep McKernon corner picked out Ryan McChesney and his header back into the danger area found McGuffie however his close range header went closely over. Glens will look to bounce back from this disappointing result when they welcome Troon to Loch Park on Saturday. This entry was posted in GAFC Fixture and tagged Glenafton Athletic, New Cumnock, Petershill, Scottish Junior Football. Bookmark the permalink.